Aquarium of the Pacific Long Beach, California! Save on tickets! The Aquarium of the Pacific qualifies as an attraction in the Los Angeles area for a discounted sightseeing pass with the GoCityCard. It's worth checking out if you plan on seeing multiple attractions. Also, check out the GoSelectCard, a total customizable pass that lets you build the attractions you want to see. 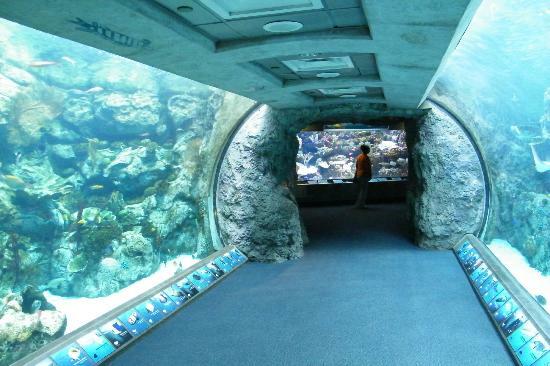 The Aquarium features 11,000 animals in more than 50 exhibits. It is the 4th most visited Aquarium in the nation. They have a variety of multimedia presentations on ocean science and important environmental topics. This is a fun and educational experience for families! In addition to the 11,000 animal exhibits with numerous opportunities for up-close encounters, the Aquarium also offers birthday parties, a 4D film experience, Harbor Tours, summer and winter camps, family festivals, sleepovers and a variety of children's educational programs. Every Day of the Year, Except Christmas Day and During the Grand Prix of Long Beach (April 11, 12, and 13, 2014). Beat the crowds! The Aquarium is most crowded during summer, holidays and weekends. If you do decide to visit on a weekend, you can beat the crowds by getting there early, between 9:00 and 10:00 am. School groups visit the aquarium on weekdays in the morning but leave by 2:00 pm. For more information on these tours click here. For more things to do while in Long Beach, visit my Long Beach page, enjoy!